When facing foreclosure you become the target of rescue scams! Do not throw your money away on false promises that guarantee to “fix” your foreclosure! CALL if a company or person asks for an up-front fee to work with your lender and modify, refinance or reinstate your mortgage. Most legitimate foreclosure prevention programs are free. If someone is charging you for their help, do not pay before a service has been provided. CALL if a company or person wants you to sign papers you haven’t read or don’t understand. Housing counselors from legitimate foreclosure prevention programs would never ask you to sign something unless you read and understand the document. CALL if a company or person is pressuring you to sign over the deed to your home or is offering you a rent-to-own plan on your home. Transferring your deed to someone else means you are no longer the homeowner and that the new owner can evict you. CALL if a company or person is promising quick results or is guaranteeing to stop foreclosure. 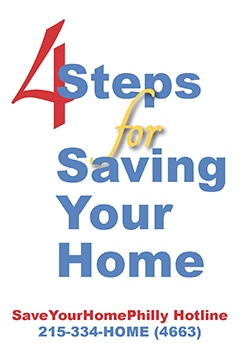 Don’t believe anyone who guarantees that they can save your home for a certain price or within a set time-frame. Legitimate housing counselors only tell you that they will do their best. Sometimes a foreclosure can not be stopped. CALL if a company or person tells you to stop paying your mortgage company and pay them instead. Your mortgage payment should always go to your mortgage company. If you are late with your mortgage payment or unsure of where to send your payment, call your lender. Do not send your money to anyone else. CALL if a company or person claims to be “government approved” or offers “official government” loan modifications. There is only one true government-authorized foreclosure prevention program in Philadelphia. CALL if a company or person offers financial assistance that you have not asked for. If someone offers you financial help by striking up a conversation in public, calling you on the phone or coming to your house, stop! Research the company to be sure that this is not a scam. Consider contacting the Attorney General’s office or Better Business Bureau. CALL if a company or person asks you to release personal financial information online or over the phone. You should only give this type of information to companies you know and trust, like your housing counselor from a legitimate foreclosure prevention program. CALL if a company or person insists on getting paid in a specific way. Very few legitimate businesses will only be paid in cash, wire transfers, cashier’s checks or in-person. Never make a payment without a receipt and remember that most legitimate foreclosure prevention programs are free. Call the SaveYourHomePhilly hotline at 215-334-HOME (4663). This hotline is part of the City of Philadelphia’s Residential Mortgage Foreclosure Prevention Program. All housing counseling and legal representation provided through this program is FREE.